CUMBERLAND VALLEY, PA (March 15, 2019) – Demolition of the former Tyco site in Carlisle will commence on March 15, 2019. This is the next step in a redevelopment initiative started by the Real Estate Collaborative (REC), LLC, a subsidiary of Cumberland Area Economic Development Corporation (CAEDC). The former Tyco site is one of three sites being redeveloped as part of the Carlisle Urban Redevelopment Plan. The other sites include the former IAC/Masland site and the former Carlisle Tire & Wheel site. “In addition to active community engagement, the Carlisle/Cumberland County region is fortunate to have the strong support of agencies, like REC & CAEDC, our County Commissioners, and others at the local, state, and federal levels who continue to step up to improve the overall quality of life for our region. Thank you REC/CAEDC as we look forward to the site’s transformation from blight to vibrancy,” added Scott. 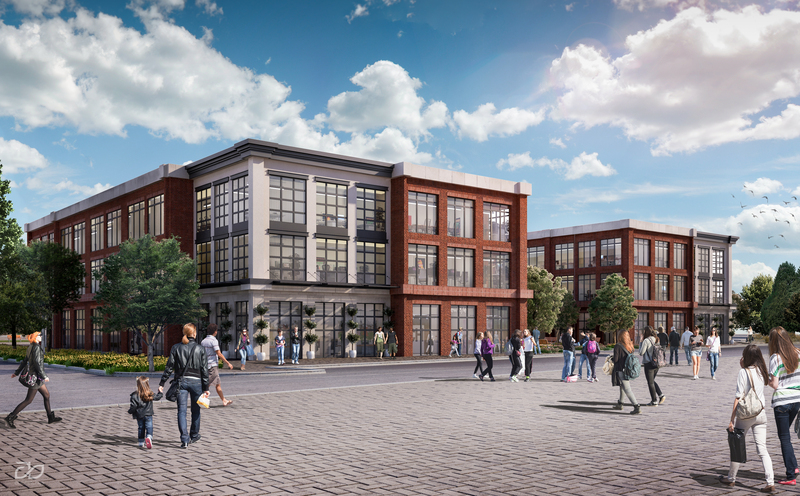 The future of the site will include a mix of retail and office space. The existing buildings will be down by the end of April with the demolition stage of the project wrapping up the end of May. REC is in the land development phase and construction will begin once tenants are secured. The new space, named Hanover Commons, will have a combination of retail and office space available at this gateway into Carlisle. There is 7,500 square feet of freestanding retail space available, which can be customized for an end-user. View more details on the retail space here. There are two buildings, each with 30,000 square feet of commercial space available that includes first floor retail and office space. View more details on the office space here. If you are interested in any of the space available, please contact Dan Alderman with NAICIR at 717-761-5070 ext. 132 or dalderman@naicir.com. REC’s partners in the project include: Cumberland Design & Building, FSA, Hub Scrap, Hull & Associates and NAICIR. REC would also like to thank our elected officials for their support including Senator Mike Regan, Representative Barb Gleim, the Carlisle Borough, North Middleton Township and Commissioners Vince DiFilippo, Jim Hertzler and Gary Eichelberger. CAEDC through its REC subsidiaries can access and leverage public and private investments to restore under producing properties and spur additional investments for the benefit of the community and the County.